• In-room dining available. View Taverne in the Sky in-room menu. View Leaps & Bounds in-room menu. An absolute must during any LODGE KOHLER stay, dining at our top-floor restaurant, Taverne in the Sky, offers panoramic views of Lambeau Field and modern rotisserie-inspired fare. A bit more casual, Leaps & Bounds Café serves breakfast and lunch along with specialty coffees, smoothies, tea and tap wine. KOHLER Waters SPA features innovative water treatments, therapeutic massage and customized facial and body treatments. Guests are invited to relax in the co-ed sauna and steam room, and to reap restorative and therapeutic benefits by soaking in our state-of-the-art Hydromassage Experience Pool. Located just across from the reception desk, the Huddle gift shop carries a unique selection of football- and gameday-related memorabilia to satisfy you and the sports fans in your life. In addition, we offer 2020 Ryder Cup merchandise, a selection of Wisconsin-themed goods and our very own KOHLER Original Recipe Chocolates. 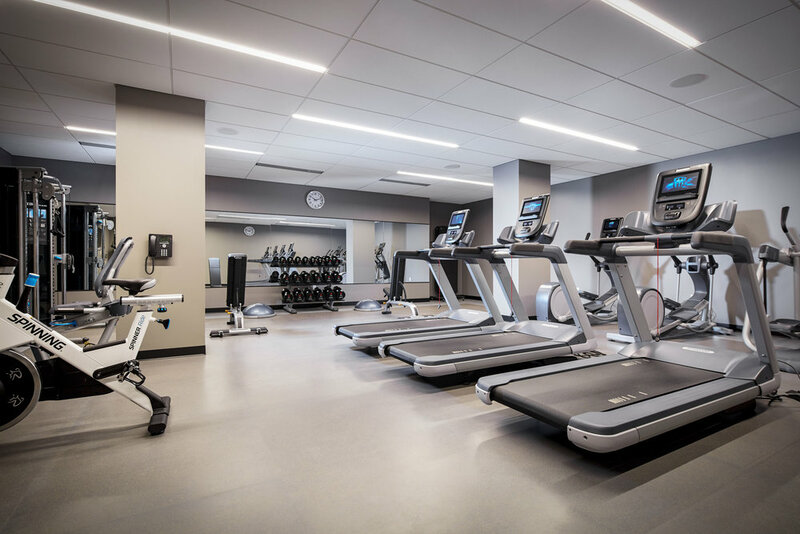 Maintain your exercise routine in our fitness center featuring treadmills, stationary bikes and elliptical machines; resistance weight machines; hand weights; and yoga mats and accessories – available 24 hours each day. Additionally, the indoor family pool features lap lanes for avid swimmers. Two-hour bike rental is complimentary for guests. There’s no better way to explore a community than on an Electra Go Bosch-powered e-bike. Pedal around Titletown to explore the area without even breaking a sweat. These intuitive, comfortable, reliable e-bikes are fun to ride and easy to operate. Visit the concierge desk to learn more.